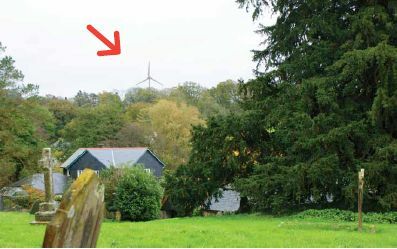 Yes the small sleepy town of Totnes in South Devon is again in the latest, the hottest front line of cultural dissonance, this time over wind turbines. 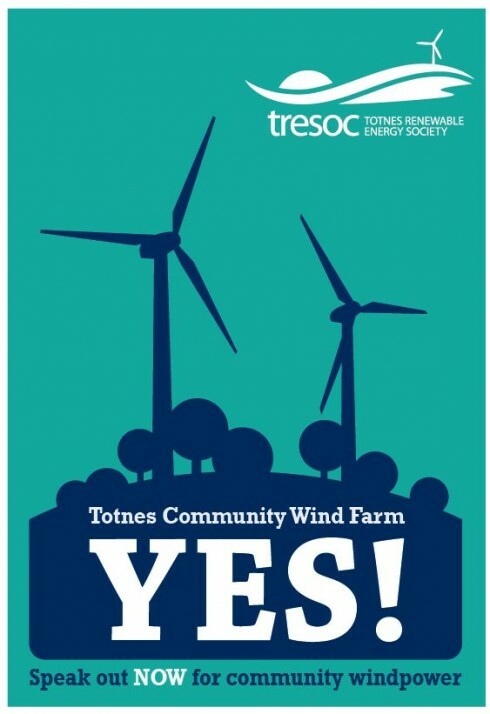 The Totnes Renewable Energy Society (TRESOC) is seeking planning permission to erect two 2.3 megawatt wind turbines in the best location for wind energy generation in South Devon, itself one of the windiest part of England. Some people love ’em some hate ’em (wind turbines that is), and we are well endowed with many in both camps. Letters to the planning officer are running slightly ahead in favour of the application, but as someone pointed out, generally no one writes to planning authorities to support an application, it is always to object, so to have that balance is, in itself, a display of unprecedented support. Now that the coalition’s nuclear policy is in complete disarray following Cumbria council’s withdrawal from a nuclear waste dump plan, and with North Sea oil and gas in precipitous decline, the only indigenous energy resource we have available are renewables. I wonder if George Osborne and his fellow climate deniers in the Tory party are still listening to the Siren song of fracking when even those in the industry see it, at best, making a minor contribution to UK energy needs? At least a fracking proposal for South Devon would unite the community! A recent tweet from DECC observed that planning applications for gas fracking in the UK would make on-shore wind proposals look “like a walk in the park” in comparison. Why not just stick with solar? We have just had one of the first large solar farms proposed just outside of Totnes. The proposal covers 42 acres (yes, that’s right forty two) with solar panels and coincidently is the same rated capacity of our wind turbines- 4.5 megawatts. But here’s the rub, it will only produce 1/3 the KW hours of energy as the load factor of solar is so much less than wind. It is sailing through the planning process with hardly a murmur of dissent. Can we afford to cover prime farm land with solar panels? TRESOC has just installed its first solar panels on the roof of the local doctors surgery, and is developing an array of other renewable energy technologies. But wind is key. And here’s the rub, we have the best wind resources in Europe. The UK will never produce a fraction of its energy needs from renewable energy without it. Ed Davey MP, the UK Secretary of State for Energy and Climate Change, has said that “he wants nothing more than a community energy revolution”. Without wind, that revolution will be more of a wash out than the summers we have been having in the last few years here in Devon. No report on the ‘community revolution in energy’ would be complete without mentioning the hate filled, negative tactics of the anti wind lobby. Unfortunately, ordinary folks are taken in by the hysteria whipped up by the anti-wind organisers. I have heard the most extraordinary things said at local parish meetings. “The wind turbines will produce vibrations that will knock all of our houses down”, sickness, and mental health problems have all been blamed on wind turbines without a shred of evidence; it’s all just the lies and sheer nonsense that pours from the sewers of anti-wind web sites. It’s clear that people living near the proposed site (I am one of the closest) have valid concerns and fears. It’s just a shame that we have not been able to have a reasoned debate based on facts, because I am acutely aware that we are all in this together. And in times like these it’s important to pull together, and I know everyone involved in TRESOC wants to do the right thing and foster good community relations in the process. We can still have a community-led energy revolution but only if we have a government framework to back it. We need clear pathways for planning approval, and the economic support that we have been arguing for to enable it. Good partnerships between local government and community owned schemes are a necessity. Otherwise the grand plans of giving power to the people just won’t happen. Green jobs? David Cameron recently said that we are in a “global race” which, he argues, will be won by the “greenest and most energy efficient”. We have gone the extra mile, Mr Cameron, now its time for you to as well. 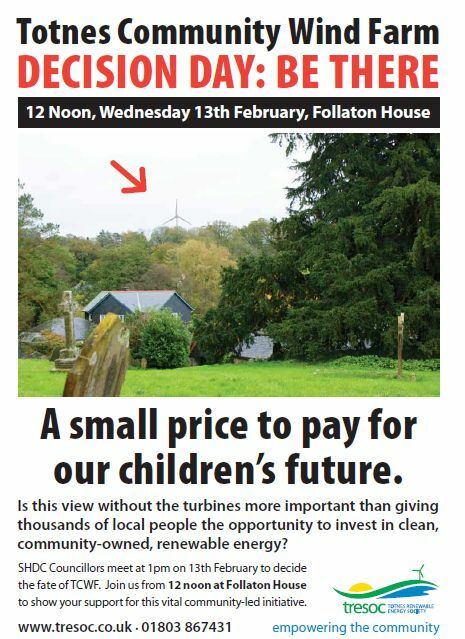 Join us at 12 noon February 13 outside the council offices at Follaton House when the final decision will be made. Transition Network recently joined charities and co-ops to urge government not to pull the plug on large community energy projects, and to support them in different ways to large commercial projects. You can read more about that here. How many people live in the church? Have the church mice complained? People in the ‘anti’ (and sceptics) lobby have such small minds and don’t seem to be able to do joined-up thinking. This situation beggars belief! Shouldn’t we be promoting solar farms which cover supermarket car parks? This would be such a sensible use of this otherwise wasted space! Let’s just clarify what the 42 acres of solar farm looks like (because two can play at misleading stats). Basically, it’s a square with sides of about 400-450 yards. About the same as six football pitches. Not, in fact a huge area. How much land is required to safely operate large turbines? I think covering car parks – supermarkets or otherwise is a great idea. But as i said in the blog, we still need wind if we are to generate the power we need- along with a serious money and attention put into energy conservation. If your planning application is refused do not give up but make an appeal. You may win on appeal. Have you considered having a meeting with English Heritage regarding their objection? TRESOC is developing projects in solar, hydro, AD, pyrolysis & wood heat. They’re all good but limited in scale. Big wind is the cheapest and biggest resource we’ve got. I agree with Finn, What’s English Heritage’s policy on this? Are they using the same policy to consider the wind turbines and other large structures or is there a specific one for turbines? Has anyone pointed out the vast resources of oil, and other resources required to make, construct, field, and service a modern wind turbine? The point should be made, that with *local* energy supplies under increasing constraints, time is *running out* to get them put up. I mean, it will be impossible to construct wind turbines, to transport them, using solely renewable energy. In the long term, I am not so sure about how “sustainable” wind turbines are. The energy payback, of wind harness for energy required to construct, transport, erect, and maintain, seems to be in the decades. Which makes repairs and replacements a problematic issue. Then there is the problem that most wind turbines and wind farms burn tax revenues like coal plants burn coal. The largest wind farms in the US average utilization of peak output somewhere between 2% and 12%, I think. Without tax money (that is, a portion of the carbon footprint of living, for each tax paying person and company), few would make or field a wind turbine. Governments facing increasing monetary constraints (being as the modern world economy is based primarily on *cheap* energy, and wind and solar are *not* cheap), tax monies are not likely to remain “sustainable”. The clock of opportunity to put up wind turbines, if they are actually worth expending the energy and monies to put them up, is running down. BTW, how does the environmental impact pan out, for changes in wind and moisture patterns, due to primary and secondary effects of wind turbines and the albedo effects of changing farm and other features to solar panels? Does a 42 acre solar construction affect water runoff, disturb aquifers, or disrupt erosion patterns of the primary site and surrounding regions? OTOH, the old style windmill has been around for a long time. The costs and side effects are well know. And, unlike wind turbines, have a reasonably small reputation for destroying birds and bats. Perhaps a couple of water tanks separated in height, with a micro-turbine generator between? Something barely above the impeding screen of trees to preserve the Church view, maybe. As for the church, you might counter-propose the California solution to energy constraints — turn off the electricity for a few hours of the day. Or just cut the voltage (and become aware of which appliances and applications destroy themselves on unregulated electricity). Of course, California picks and chooses, deciding “leave the lights and heating/air conditioning on for these” and “turn it down for those”, calling them rolling blackouts and rolling brown outs. Yep. A nasty issue. Plenty of room for flares of passion. But it seems you skipped a step, in the planning of the wind farm. The rest of the community apparently isn’t aware that energy supplies at the “industrial age” levels are not going to continue at cheap prices *or* at supplies sufficient to modern usage. So they are not discussing “how do we cope with dwindling energy”. Instead it is the evil corporations (makers of wind farms, operators of huge trucks hauling components for wind turbines, etc.) and quaint, if well-intentioned, locals vs. locals with other dreams and memories. Here in the states it has been referred to as “not in my back yard”. Luck in finding a useful answer. What a wonderful blog Naresh, thank you for this. I like the idea of inviting David Cameron to the meeting on Wednesday. Are there not lots of other well known sympathisers we could call on to be there? Has anyone invited our local MP by any chance? Surely if we had the backing of someone in the government who is pro wind, it would help to swing things? 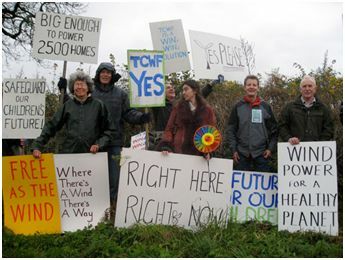 In 2007 many in Lewes and Ringmer supported the Glyndebourne wind turbine application. Their turbine was built. Do not give up if you believe this is what Totnes needs to power its future. @ Ian Bright. Sorry. Here in the US they quote a 20 year pay back on carbon. Who is “they” in the US who quote a 20-year payback on carbon? Peer-reviewed papers show a payback at a year or less. Also, typical capacity factors for large turbines are much greater than 2-12%, assuming that is what you mean by utilization of peak output. They usually range between 20-40% onshore, greater offshore. Sorry, I don’t have the references. What I recall is not what the output of a turbine, or farm is. What I recall is that utilities actually utilized 2% to 12% — or less — of the established wind farms in the US. I think one was in Texas. When you quote a carbon pay-back of a year, is that a fully burdened number? For instance, the diesel trucks needed to transport the rotor and column, the special-built trailers needed to transport the oversized loads, the pilot vehicles needed, building the factories and work forces to make the equipment to make the turbines? What about the carbon footprint of the man hours spent constructing components, transporting and erecting, then maintaining the turbine? What about the man hours spend in public hearings, and other stages of planning and procuring licenses? I consider that every man/woman hour spent, either under employment, contract, or public discussion, represents 1 hours’ worth of the carbon utilized in a year by that person and their dependents. I consider the carbon/energy burden of any money spent by government to be doubly burdened. Each bit of revenue collected carries its bit of burden, then the government amplifies that burden by the burden of government employees, facilities, and time spent following various procedures of application and review, and then there are the special interests involved. If I said that a hour’s broadcast of an interview at, say, Lupin Naturist resort (back in 1980s), consisted of the electricity consumed by the broadcast equipment, editing, and transmitting gear, I would be glossing over things just a bit. The crew used vehicles to drive to the location. So did each of the 60 or more people, some from neighboring facilities 100 miles away. Then there is the hour of time spent by the hundred(possibly more, it was a morning show in San Jose, CA), that accounted for 1/8766th of the carbon/energy each viewer (and crew, and participant) expended that year. The viewers expended electricity to power their TV receivers, rather than fuel for transport to the location. Peripherally, the TV station promoted the event, spending carbon and energy of their viewers each time. Time was spent coordinating to set up, and follow up the show by crew, station staff, and event organizers. When you put up a wind turbine, especially once you start diverting public attention from their other affairs, you start accumulating carbon/energy footprints that a wind turbine might retire in a year. If the electricity produced were actually consumed at the rates you quote. Maybe. Perhaps I look at things a bit zealously. Back in the 1980s I worked in California’s Silicon Valley, near San Jose. A co-worker described the then-ebbing drive to renewable energies of the 1970s, before my arrival. Steve told me that the only adaptation that actually returned value for the investment was using solar panels to pre-heat water for the water heater. As far as I can tell, the Sun hasn’t shown any brighter, delivered any more energy to the Earth since then. And it is the *dispersed* arrival of energy from the Sun that is the bugaboo, that cannot compete with harvesting in moments the billions of years of carbon sequestration we call “petroleum” and “coal”. As for the wind turbines, producing electricity from wind is a good fall-back, backup power source — for the full-up, industrial electric usage I thought was recognized as unsustainable. And this is my only real reservation about wind turbines, that they are a temporary stop-gap that we cannot afford in terms of carbon, energy, or money, that diverts us from the passive building construction techniques and insulation programs, and finding low-energy, local craft and food production techniques that will go further, and are likely to improve social resilience. No government can spend money on any program, without creating industries heavily invested in taking part in that cash flow, and keeping that government spending at ever increasing levels. Wind power special interests are certainly no exception. At the same time the US arrests those that molest individual birds, they have licensed wind farms for ten years, since the current five year renewal is annoying, for the protected and migratory birds destroyed by most turbines. Funny, that, since siting the turbines generally looks for prominent air flows — that happen to coincide with many bird migration paths. We can turn off water for irrigating crop lands to save an endangered minnow (California) — but wind turbine operators are licensed to slaughter protected birds. The bird and bat ‘issues’ are generally non issues as far as wind turbines are concerned at least in the UK. There is a tried and tested policy regarding the siting of wind turbines on bird migration routes. And if you look at the statistics, windows on buildings and cats decimate bird life by a factor of 100x or more than any wind turbine. So if you really care about birds, then black out your windows and get rid of your cat. Naresh – I’m sure you have already had discussions with English Heritage, but I wonder if it’s worth trying to have one last face-to-face meeting to see if there is any chance of changing their stance on this (or whether a strategically place tree at the edge of the church yard might help minimise the visual intrusion)? English Heritage seem to have a knee-jerk ‘No’ response. They objected to solar PV on the roof of a 12th Century Grade 1 listed church in Melbourne, Derbyshire but, with strong support from Transition Melbourne, the project still won planning approval. I’ve spent the past few years living in both Greece and the UK,sometimes driving from one to the other. On the Greek island of Spetses we can see the windfarms on the mountains of the mainland – proud rows of these beautiful sculptural energy providers that add to the majesty of the mountains. I’ve recently been driving to different parts of the UK and am delighted to see wind turbines on the increase. I’ve seen them in different settings and not once have they spoilt the view in any way at all, if anything, their beauty is an addition that does not spoil the countryside in any way. There are so many things that spoil our environment (car fumes spring to mind here, as do out of town shopping malls, etc) – it’s a shame to see English Heritage being so shortsighted as to respond negatively to the turbines which could go a long way to providing us with clean, renewable energy. Really sorry to hear that the councillors decided against your proposal in the end. Having just been through a planning appeal inquiry with the Ecological Land Co-operative though, I would recommend the appeal option. Many Council planning committees seem to regard themselves as accountable to no-one (ours even overturned the recommendation for approval of their own planning officers), whereas the National Planning Inspectorate give full and fair regard to planning laws, by all accounts. We are still awaiting the appeal verdict in our case, but the Inspector impressed us at the inquiry and seemed determined to hear all sides. It was a far more positive experience than the ‘hearings’ at the Council, at which we had to listen to disinformation without any opportunity to correct it. Lick your wounds and then consider going again.